Izzy and Juliana tool around the antique hippie mecca of New Hope, where he comes face to face with a new pair of pants. I found myself in a hippie haberdashery with Juliana. A shopping demon I did not see coming had taken possession of her. She was looking at a tabletop of miniskirts, holding them up against her waist. Eventually Juliana found one that worked for her and moved her attention on to me. Apparently, I had to have a pair of bell-bottom pants. I didn’t have anything closer to a hippie uniform than dungarees and tee shirts. It would take years and years before faded Boy Scout uniforms were cool, and that would last only briefly. “You’ve got money from the party,” she said, sweeping away any argument I might have against buying a pair of pants I didn’t have any desire to own. They seek him here, Ray Davies sang, and they seek him there. We looked at a lot of pants: stripes and jeans and polka dots and paisley. Paisley! When I pictured myself in these fantastic things, I thought I was looking at an advertisement. Eventually, I tried some of them on in a dusty changing room and paraded about for Juliana’s inspection with no shoes on. None of it seemed like me, a scout who was too old to be one, who practiced Thrift because that’s what we sons of failed Quakers do. Eventually I chose a pair of grotty blue- and white-striped bell bottom pants that clung weirdly around my hips and set sail at my calves and unfurled themselves onto the floor. For a moment they felt like something I wanted or even needed—a token to get me through some cultural turnstile. It almost seemed like a good idea as I carried them to the cashier, though the choices by then had all run together in my mind. I don’t know whether I chose the pants I chose or they had chosen me. They seek me here; I seek them there. 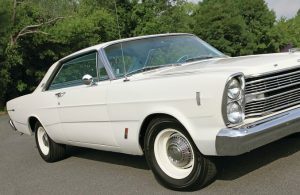 Later, he sees a cigarette dropped on the street in New Hope, PA, from the window of a 1966 Ford Galaxie 500.